When most of us think of sapphire we think of a beautiful blue gem. Sapphires occur in a rainbow of colors. Sapphire are found in a variety of hues including pink, orange, yellow, green and purple. Both sapphire and ruby are members of the corundum family. If the predominant color is red we call it a ruby, otherwise its a sapphire. Some of the best known sources for sapphire are Burma, Kashmir and Ceylon. The coloring agent in blue stones is iron and titanium and in velvet stones, vanadium . In ancient times, the sapphire was considered the symbol of heaven. It was also said to bestow innocence, truth and good health upon the wearer. Today we view a sapphire's beauty as its own reward. 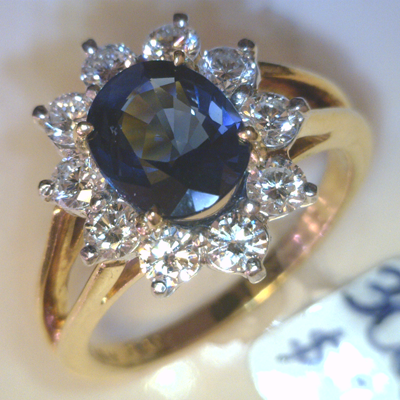 Sapphires are a good choice for your jewelry. Its a tough, durable gemstone that can be used for a variety of purposes. Sapphires display pieochroism. By that I mean as you rotate a sapphire you will typically observe slightly different colors. 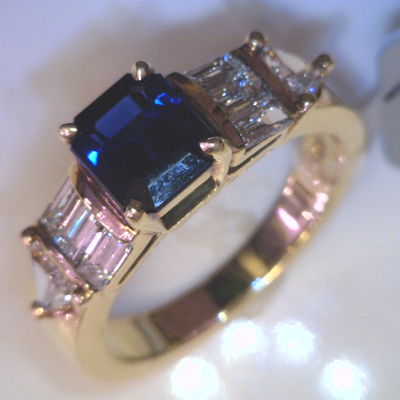 In a blue gemstone you might see blue and then what appears to be a slight darkening of the color. A blue stone could also appear blue then bluish green. A yellow stone might appear yellow then greenish yellow. A green stone might appear green then yellowish green. 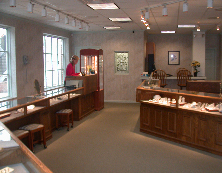 Come see our collection of sapphire jewelry in styles ranging from traditional to the more contemporary.